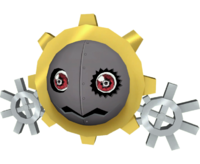 A mutant Machine Digimon shaped like a gear. There are countless gears built into its body, and the gears are constantly rotating. For that reason, if even a single gear is missing, all of the gears in its body stop rotating, and it becomes unable to maintain its vital functions. 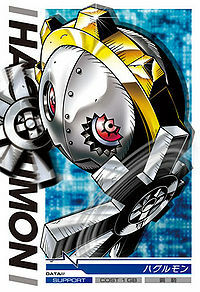 Hagurumon possesses the special ability to send a computer virus to its opponents in order to manipulate them at will, and that ability is exploited by fiendish Digimon. However, because Hagurumon itself doesn't have any sense of self, it doesn't even know it is being misused. Its Special Move is burying a black gear with a built-in computer virus within the body of the opponent, driving them mad (Darkness Gear). 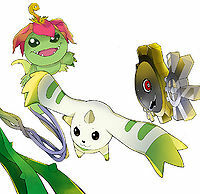 Terriermon, Palmon, and Hagurumon, the Child Digimon who appear from the distortions in the Lower Area. These are the first Digimon the Player meets after obtaining the Digimon Capture. Catching them, can the Player become a Hacker...? n., From Haguruma 「歯車（ハグルマ）」 meaning gear. 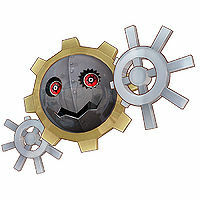 ダークネスギア Dākunesu Gia Cog Crusher/Darkness Gear Shoots black cogs from its face that can control Digimon they're embedded in. Releases a stream of data. 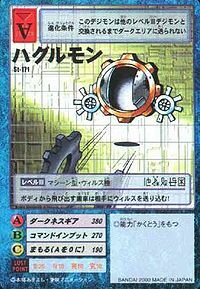 Makikomi  Entangle 巻き込み N/A Entangle Spins around, hitting the enemy with its gears. Explodes or runs into the enemy to electrocute them. 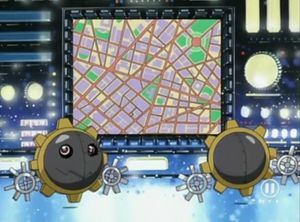 Two Hagurumon in Digimon Adventure. Two Hagurumon served Mugendramon, working as his advisers and message-runners for his army. 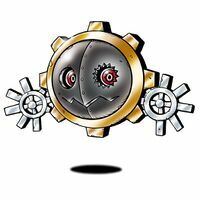 A Hagurumon was seen when Ruki fixed a clock, awakening a Megadramon who proceeded to cause havoc. Hagurumon appears as an unobtainable Digimon in Digimon World. Toy Town is a city that used to be ruled by Monzaemon, but soon it went missing and the Town was taken over by Waru Monzaemon, and Hagurumon was one of the victims, who got kidnapped by the Waru Monzaemon. When the Player reaches to Toy Town, the town appears to be isolated, and when entering one of the buildings, the Player will see two Blikmon who will tell the Player about what happened in Toy Town and that Hagurumon got kidnapped, so the Player offers to rescue the town, but the Blikmon refuse to do so unless the Player has a Monzaemon as a Partner, so that it can enter the Toy Mansion. Once the Player makes its way up the final story of the Toy Mansion, the Player will face Waru Monzaemon, engaging a battle, and once its defeated, it'll release Hagurumon, where the Player picks it and brings it back to the Blikmon, giving back the life to Toy Town, and a lifeless Monzaemon suit will join the Village of Beginnings, upgrading Jijimon's house and residing in a coat hanger. Since Hagurumon is treated as an item in the game, the Player needs to be careful when engaging a battle, in case the Player loses a Battle, and as consequent the items, where Hagurumon may be one of them. If done so, the Player must go to the Secret Item Shop in the Gear Savannah where the merchants will sell back the items the Player has lost. 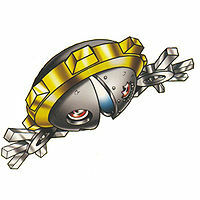 Hagurumon is an obtainable Digimon. Can evolve to Numemon (0 DP), Scumon (1 DP), Platinum Scumon (2-3 DP), Raremon (4-5 DP) or Guardromon (6+ DP). Evolves from Choromon at level 11. 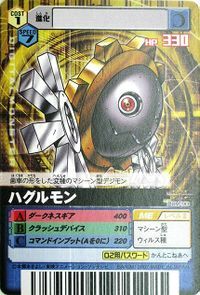 Hagurumon may evolve to Guardromon (at level 21) or Mechanorimon (by Card Evolution). 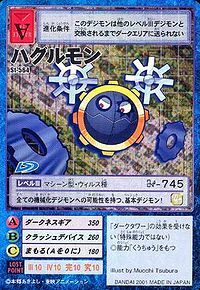 Hagurumon may evolve to Guardromon or Mechanorimon at level 11. 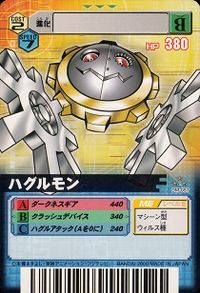 Hagurumon is an obtainable Digimon which is evolved from Budmon, Gigimon, or Wanyamon, and can evolve to Devimon, Guardromon, Meramon, or Sunflowmon. It can also be obtained as a collectible card. 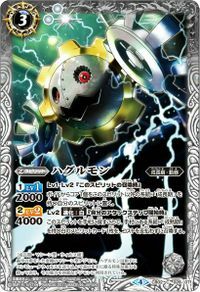 Its card is part of the Machine Digimon (マシーンデジモン Mashīn Dejimon) set. Hagurumon is one of the three starters. Its attribute is electric. 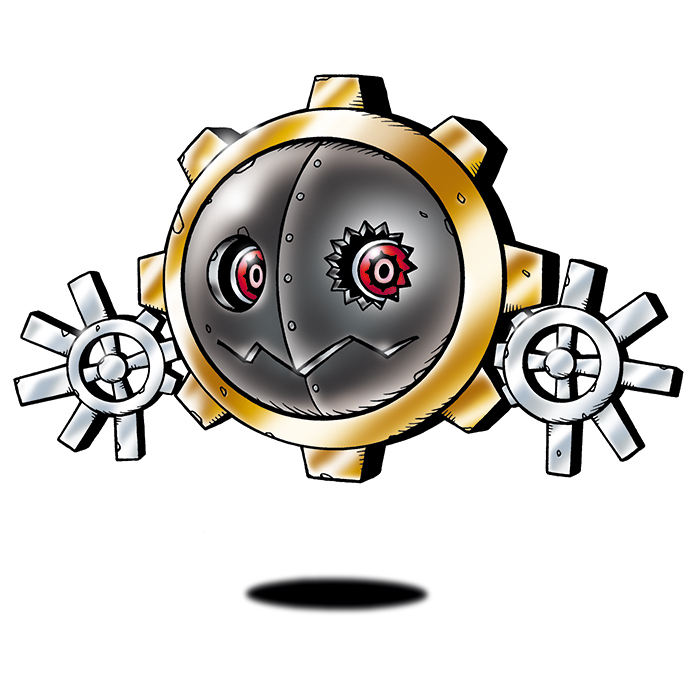 It evolves from Mochimon, and can further evolve into Guardromon, Clockmon, Starmon, Platinum Scumon, or Gold Numemon. Evolves from Caprimon. Can evolve to Greymon, Tankmon, Guardromon or Mechanorimon. Evolves from Caprimon. Can evolve to Greymon, Thunderballmon, Guardromon or Mechanorimon. Evolves from Missimon. Can evolve to Dobermon, Meramon, Sangloupmon, or Snimon. 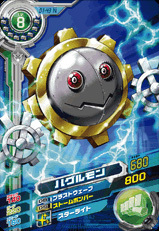 This gear Digimon is a fearsome virus! The gears it shoots out from its body send a virus into the opponent! It buries enemies in black gears embedded with viruses that can control the opponent! 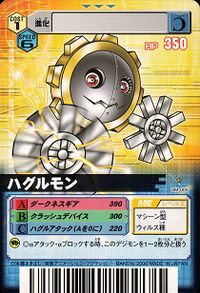 This basic Digimon holds the potential to evolve into all sorts of mechanical Digimon types! 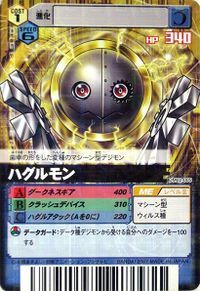 This steel mastermind aims to evolve into a powerful mechanical Digimon! 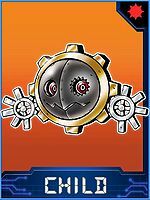 A mutant Machine Digimon shaped like a gear. 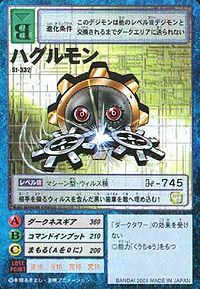 A mutated Machine Digimon in the shape of a gear. 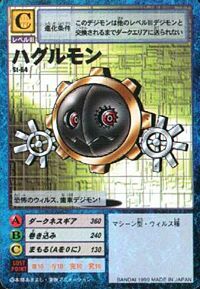 A mysterious Digimon that has the shape of a gear. 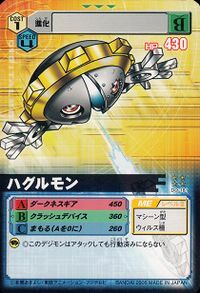 It has the special ability to use a computer virus to manipulate the opponent. A mutated Digimon that gained the ability to move from its setup of gears. It becomes unable to move if even one gear is removed. Its Special Move allows it to manipulate other Digimon to do evil deeds. 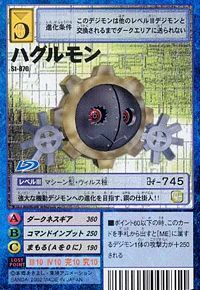 A mutant Machine Digimon shaped like a gear. 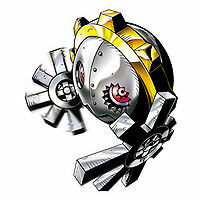 Hagurumon possesses the special ability to send a computer virus to its opponents in order to manipulate them at will, and that ability is exploited by fiendish Digimon.